How sweet are these Rocks Meringue Kisses? 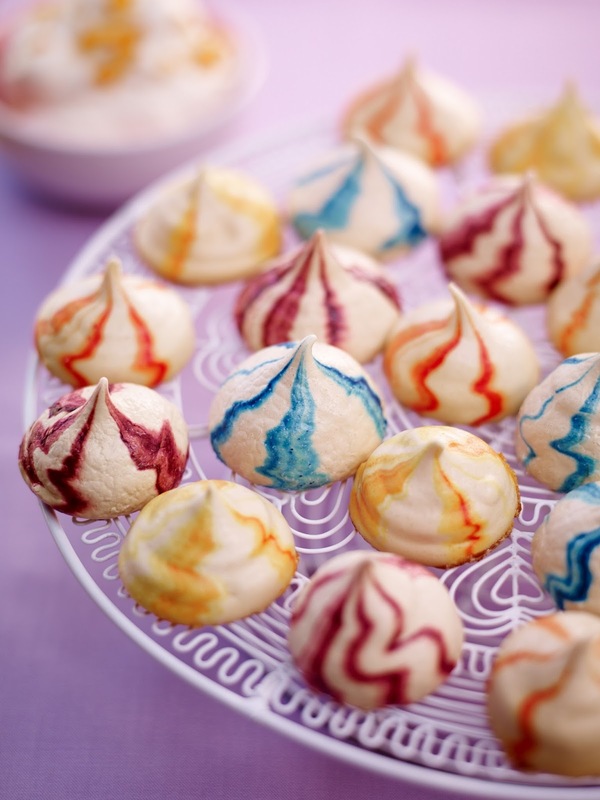 Make these little meringues rippled with coloured, squash flavour swirls and pack them for a posh picnic or impress guests with this simple yet impressive dessert. Serve with several different flavoured creams so there’s a choice to suit everyone taste. Your choice of additions to flavour the cream e.g. squash, fruit zest, vanilla, etc. Heat the oven to 220C/200C fan. Set 4 disposable piping bags inside 4 tall glasses, with the open ends upwards and gaping ready to be filled. Generously paint stripes of the food colouring inside each bag with a small paintbrush and set aside. Spread the sugar over an oven tray lined with baking parchment and cook until it has just begun to melt at the edges, but not caramelised. It takes around 4 mins, but keep a very close eye on it. 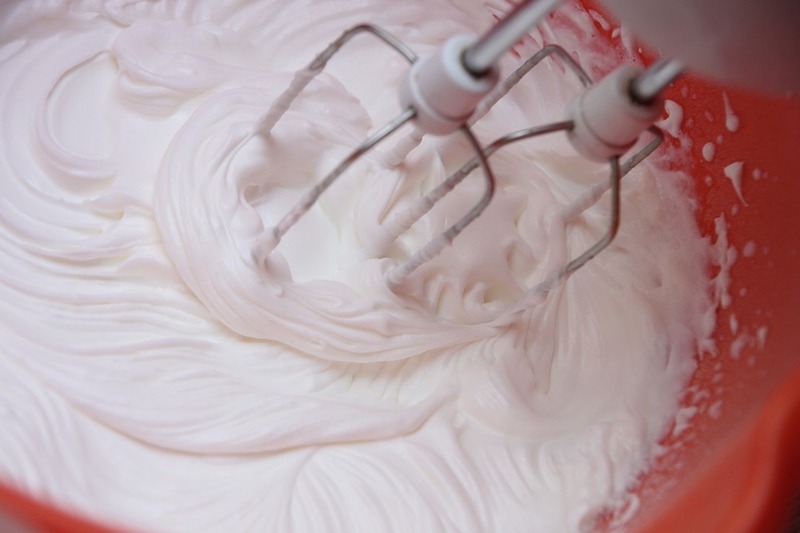 Meanwhile, whisk the egg whites on a high speed to stiff peaks. Carefully take the sugar out of the oven and add the hot sugar little by little and whisk until the mixture is cold, big and glossy and holds its shape. Take great care not to burn yourself with the hot sugar. Turn the oven down to 80C/60C fan. Divide the meringue between 4 smaller bowls and fold one flavour of squash into each. Spoon each meringue into the corresponding piping bag, twist the open end of the bag and snip off the other end to create an opening approximately 2cms wide. Pipe, onto baking sheets covered with parchment, smooth circular meringues, approximately 6cm wide, with a peak on top. Make sure they’re well spaced as they’ll grow when they cook. Once all the meringues are piped bake for 2hrs till they’re crisp on the outside and sound hollow on the inside. Switch off the oven and leave until cold. Use immediately or keep in an airtight tin. When you’re ready to serve, make the creams. Beat the cream until it holds very soft peaks, divide between 3 bowls and flavour each as desired. Serve with the meringues for everyone to dig in. "We Should Be Wearing Sandals Now Not Wellies.."
"#BiB’s Short-listed Beauty And Fashion : Creative Mondays Blog Hop"
These are amazing Claire – congrats – you are one of our Featured Guests at Inspire Me Monday at Create With Joy!